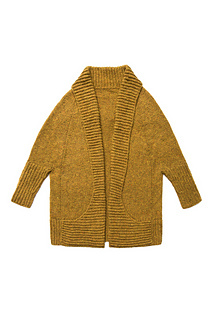 This open-front drop-yoke cardigan is the height of snuggly fashion. 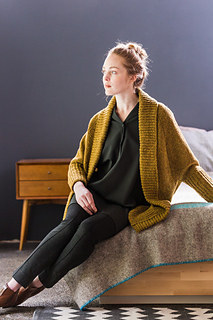 The brioche shawl collar, shaped with simple short rows, sweeps back to form pockets at the hem, and the sleeves begin below the elbows to create a cape-like silhouette. 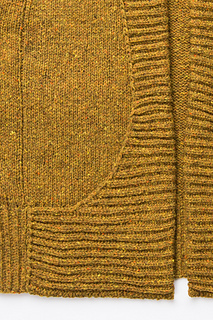 Tiny gutters of purl stitches trace a flattering A-line from hem to neckline within the volume of the coat. 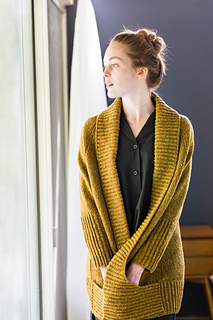 Top-down seamless construction makes Ronan a straightforward knit, and woolen-spun Shelter keeps the fabric light and airy despite the generous ease and long length. 32″ circular needle can be used instead of DPNs if using the Magic Loop method for working small circumferences in the round (e.g., Sleeves).